Ah! How on earth am I 26 weeks already?! These weeks are flying by now but I can see the next few weeks are going to drag as I can't wait to reach the 30 weeks point. I have struggled with bending down and walking a fair distance this week. I have also suffered with leg cramps when I stretch! I really want to do a BIG stretch but after having a huge cramp on my right leg Monday morning I haven't had a good ol' stretch since! Boo! The girls have stressed me out a lot this week. They have been good but there have been days where I have just broken down because I just didn't have the energy or just didn't know what to do. I think I am just needing a one night break away from kids for a change. But I will have to wait until June for that! My hormones have been all over the place, I have cried a lot and just crying over silly things too. I have been suffering with back pains when I sit on my sofa, but other than that the back pains aren't there often - yet! Other than everything there, I have been OK haha. 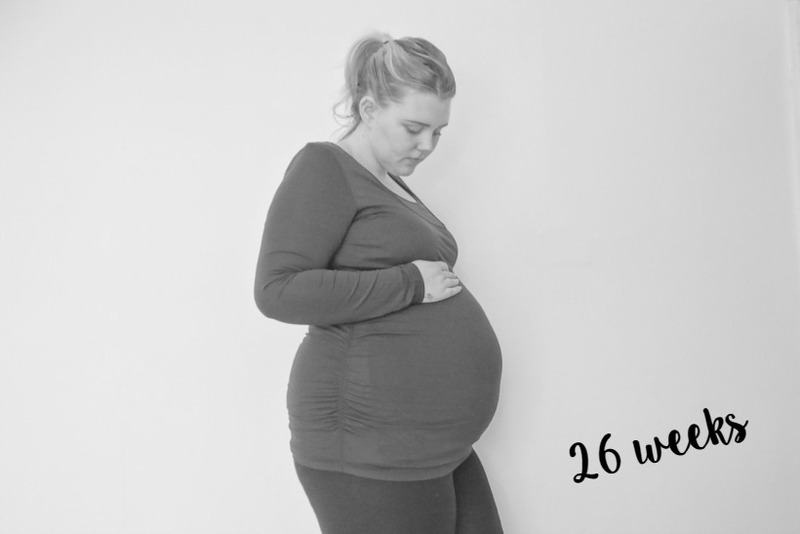 You may remember me mentioning on my 25 week pregnancy update that I was having my GTT test last week - results came back fine and I don't have diabetes! Elliw came with me to see the midwife and she got to help listen to baby's heartbeat. It was so adorable. She loved helping the midwife and I am so glad my midwife was so lovely in letting her do so. My next appointment is just a normal blood test next Wednesday as usual. My results were the same as last week which is good. But I can see this weeks blood levels going higher as I am itching more. With the girls the itching didn't come full on until 30 weeks roughly, so if this is the same, I have a few weeks left of freedom - ish! The girls ask a lot about there baby brother. They are still both really excited about meeting him. Baby boy is still moving a lot! He loves pushing his bum or legs up and getting me uncomfortable. He moves a lot more during the day now and I can definitely tell he is there! He loves to use my bladder as a bouncy castle too! Some lower back pains from sitting down some evenings. I have had a few period type pains one evening and it was so uncomfortable I ended up going to bed extra early. Hormones have been a bit all over the place and have been pretty emotional. Sore and itchy breasts - ugh! I remember the leg cramps and the indigestion as I got bigger. The next few weeks will fly by in no time! I can sympathise it can feel like it's taking forever by this stage. Good luck. What a fantastic beautiful bump. Hormones are good - Mean that your body is doing its job! Hope you are slightly more comfortable soon. It's hard when you have aches and pains to fully enjoy being pregnant. I hope you get to rest plenty. I hope June comes by quickly so you can get some relaxing time. I was fed up by 20 odd weeks, the rest flew by though! Yay glad you don't have diabetes! Hang in there hunny hope things get better and your back pain subsides! Ah yah, delighted to hear you don't have GD. I've to get the test on Thursday, fingers crossed! Oh my gosh I remember the leg cramps! I'd just have to muffle my face in my pillow to stop screaming when I'd wake up in the night with it! So painful. Not too long to go now and nice to enjoy your girls a bit longer before their bro makes his appearance! Your doing great! I had to have a GTT during my pregnancy too and I know how uncomfortable they can be. Your pregnancy seems to be going super quick being an outsider. Thanks so much for linking with #KCACOLS! I hope you come back next Sunday!